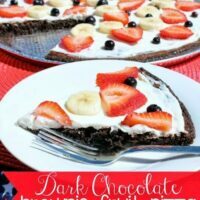 Dark Chocolate Brownie Fruit Pizza - Dessert Now, Dinner Later! I seriously love this time of year! All the BBQ’s, parties, & sunny days! 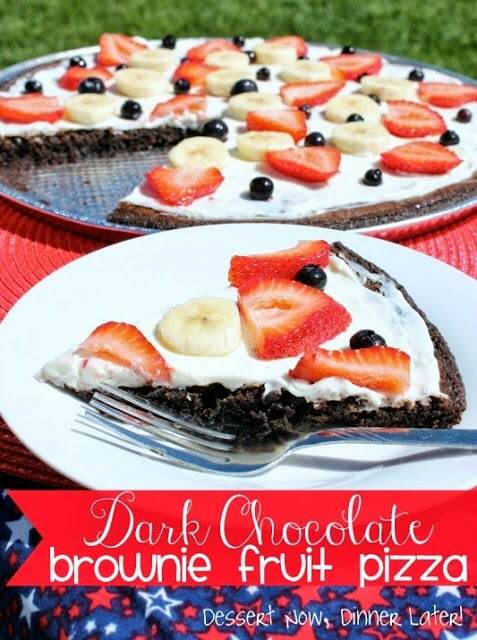 This dessert is perfect for any party & especially the 4th of July coming up because it uses red, white & blue fruit. Add as much as fruit as you want! My pizza is a little sparse, but this dark chocolate brownie mix is fabulous. It’s chocolatey without being overly sweet. It’s also nice & moist with the perfect level of thickness in every bite. I could eat the whole pan! 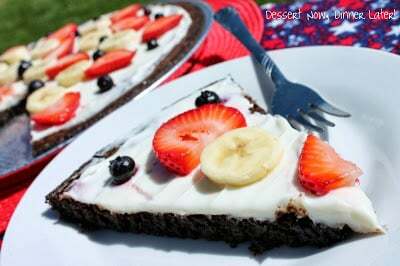 Who doesn’t love brownies, cream cheese frosting, & fruit? Bake at 350*F for 25 minutes (check doneness with a toothpick.) Remove from oven to cool. Meanwhile, blend cream cheese & powdered sugar. 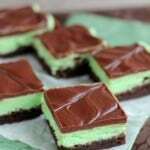 Spread evenly over cooled brownies. Thinly slice the banana & lightly toss in lemon juice to prevent browning. Hull & slice the strawberries as well. Alternately place fruit in a desired pattern on top of frosting. Slice & serve. Keep refrigerated. This looks great! I can’t wait to try. Also if anyone wants to come and check out my new blog. 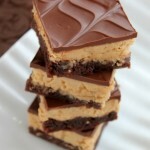 http://www.happierhappenings.blogspot.com Thanks! looks yummy 🙂 I need to try this soon!! Pinned! This looks goregous! 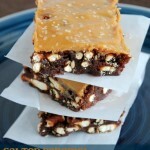 My mom has made this with cookie dough, but I don’t ever think with brownies. Will have to try! 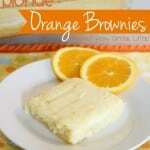 Brownies are my fave and I’ve never thought of making them like this! What a great idea! Definitely pinning and trying!! Genious!! Why did I not think of this. I love making fruit pizzas in the summer time, but always make it with the sugar cookie. Love the dark chocolate brownie idea… so gonna try this! This is a keeper. Thanks for sharing at Saturday Dishes.